Some large, flat special collections materials will be UNAVAILABLE beginning April 2, 2018 for the installation of new flat file storage. 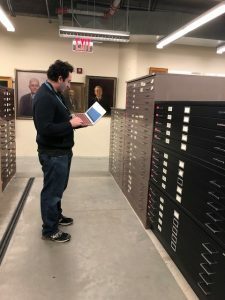 We do not have a set end-date for the project, but researchers should expect that items stored in our flat files will remain unavailable through the summer. A: We are replacing our old flat file storage with moveable carriages that will allow us to double capacity. Because our building has no onsite swing space, existing files need to be moved offsite so we can install the new system. Stacks manager Joseph Azizi standing near some of our current flat files. Notice that behind Joseph is a black strip in the concrete. This is a rail for a moveable flat file carriage. These rails were installed when the building was built in 2004 with the expectation that we would eventually get moveable flat file storage. Needless to say, we are ready! This is a moveable file system similar to the one we are installing. The only difference is that ours will move automatically, rather than manually. Not only does the compact structure allow more rows, but we can store additional collection materials above the flat files. Double efficiency! Q: What collection items are impacted? A: Flat files are used to store many of our largest items, including some maps, posters, large broadsides, genealogical charts, galleys, panoramic photographs, and architectural drawings. Q. Can I request items to be retrieved from their temporary location during this process? A. Unfortunately, no. All items will be stored offsite in a manner that renders them impossible to access until they are placed in the new drawers. Q: How do I know whether the item I need is stored in the flat files? 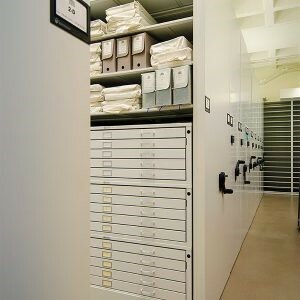 A: If you are planning a visit to study items that you believe may be stored in flat files, we can help you determine whether that is the case. Please submit a reference request with a list of the items, and a staff member will inform you of the status of the materials you are hoping to view. Due to legacy metadata formats used for many items stored in the flat files, we are unable to show the status of most flat file materials in Virgo. Q: Are the items digitized? Can I see images in place of originals? A. Some items are digitized and their images are visible in the item’s Virgo record. Many items are not yet digitized. If you are unable to come back to visit the library in person after the flat files are reopened, please submit a digitization request. As soon as we have access to the flat files again, we can begin filling these requests. Q: Why can’t you provide an exact end date for this project? A: This is a once-in-a-lifetime project, so we are expecting the unexpected. If all goes smoothly, we hope to announce in mid-July that the new flat files are open to researchers. But just in case, researchers should not expect materials to be available until late August. We thank you in advance for your understanding as we undertake this crucial collection-maintenance project. It will allow us to continue to add to our oversize collections. And it will also allow us to continue to provide you with one of our proudest services: delivering the flat items you request within just a few minutes of your request! If you have any questions about the flat file project, please submit a reference request.